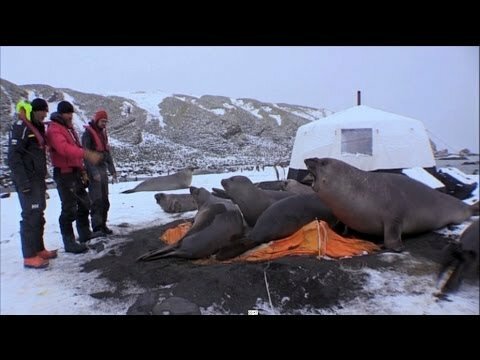 While working on an upcoming nature documentary about life on South Georgia Island in the cold southern Atlantic ocean, filmmakers were given an inside look at the curious behavior and habits of its native elephant seals -- most notably, that they'll sit there if they want to. Returning to camp after collecting footage for "The Adventures of the Penguin King", crew members discovered a group of seals making themselves comfortable atop one of the cinematographer's tents. If the bold animals seem unrepentant for mussing up a human's makeshift home, it could be that they're simply returning the favor. South Georgia Island wildlife has been decimated by a rodent infestation after whaling vessels inadvertently introduced rats there in the 18th century -- a problem currently being treated with poison, dropped from the sky over 70 percent of the island. But, yes, it probably was once a pristine tent too.